Come September, the DCU is getting EEEvilll as the villains mount their own month long crossover event entitled, FOREVER EVIL!!! It's like a plot right out of the Legion of Doom itself; not only will these issues be coming out every week, but they sport a snazzy 3-D MOTION cover and you KNOW you gotta get 'em all, like Pokemon, son! To make things easier, we have created a handy dandy subscription list for all of our customers who are interested in signing up for the massive DC event of the summer! 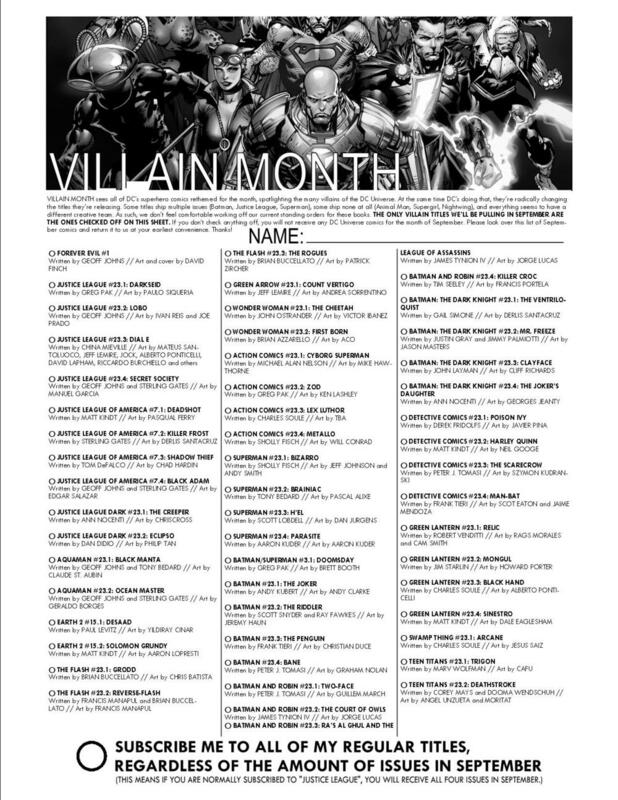 This week, the nice staff of Zanadu will be handing out bright yellow pieces of paper with a full list of the Villain Month tie-ins, including creative teams. Check off any titles you are interested in, sign your name and drop it off by the 18th or Gorilla Grodd will do horrible monkey mind things to you!! !